Biatain Silicone Ag and Biatain Ag are conforming dressings with 3DFit Technology that fill the gap and reduce exudate pooling to promote optimal healing conditions. Biatain Silicone Ag and Biatain Ag have been shown to kill 99.99% of mature biofilms (P. aeruginosa) and to prevent biofilm formation (shown in vitro)1. Conventional foam dressings leave a gap between the wound bed and dressing, allowing exudate to pool. This may promote bacterial growth leading to increased risk of infection and subsequent development of biofilms. Biofilms are clusters of bacteria and fungi embedded in the wound environment, which can form within 24 hours. Biofilms are difficult for the immune system and antibiotics to eradicate2. New research shows that biofilms can be found both in the wound bed surface and in the tissue below the wound bed3. Its presence can lead to infection, inflammation and delayed healing4. removes slough and non-viable tissue, including some biofilms, prior to the application of a dressing. The active component should be effective against biofilms and a broad range of bacteria and fungi to support optimal healing conditions. Biatain Silicone Ag and Biatain Ag have been shown to kill 99.99% of mature biofilms (P. aeruginosa) and to prevent biofilm formation (shown in vitro)1. Both dressings are also effective against a broad spectrum of bacteria and fungi for up to 7 days1. Biatain Silicone Ag and Biatain Ag conform to the wound bed to reduce exudate pooling and deliver Ag at the wound bed. The microcapillaries within the foam absorb exudate vertically, triggering the release of Ag. Exudate is locked away and retained even under compression, reducing the risk of maceration and spreading of infection to the wound edges and periwound skin. The patient was an 80-year-old man with type 2 diabetes mellitus for 20 years. The ulcer was infected with S. aureus and Corynebacterium. 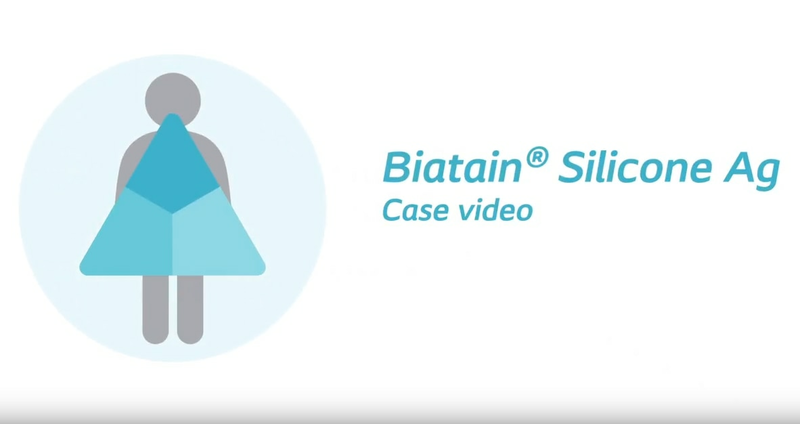 Duration of the ulcer was 8 weeks prior to treatment with Biatain Silicone Ag. See a short case video of the case described above.